The American Flag flying high at the Dayton Ohio Airforce Museum. This was my first year to make the Labor Day weekend trip to Dayton Ohio and it won't be my last. 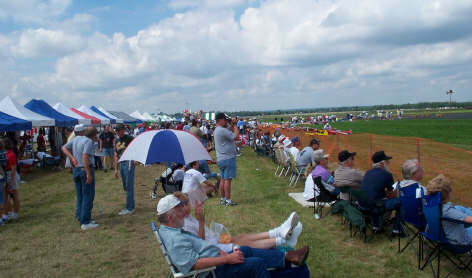 There was just about every type of R/C airplane present at this event with shoulder to shoulder spectators. The flying took place behind the Air Force Museum so if you can find the Museum you can find the flying field, just follow the signs from the Museum parking lot. Matt Chapman Airshows put on a demonstration Saturday at 12:00 to kick off the other R/C demo flights that would follow. Matt was available for autographs after his show and could be seen wondering the pits talking with fliers later in the day. Pictured above is the Outlaw which was flown Saturday as a demo. 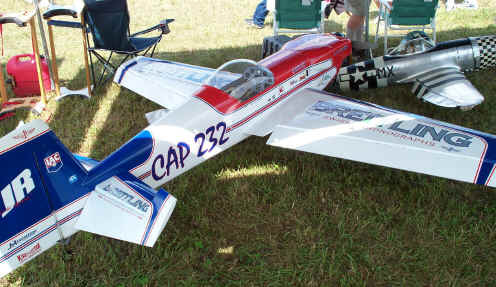 The Outlaw flew knife edge and the roll rate was unbelievable to say the least along with a flat spins etc. etc. 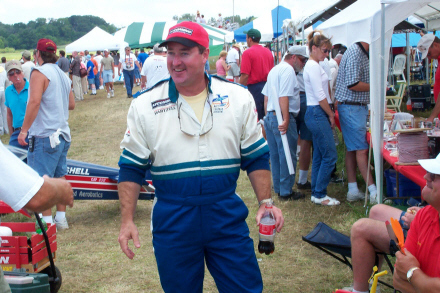 Matt Chapman seen talking to fliers in the pit area. 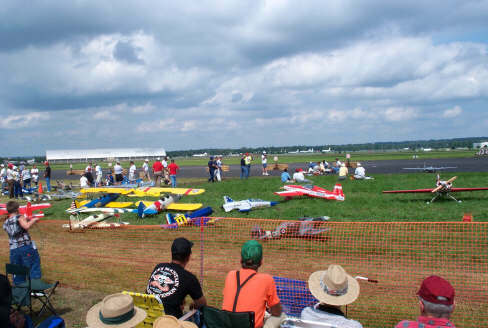 The active flight line was a bee hive of activity. This picture represents about half of the models in line to fly. Looking down the pit area on Saturday. 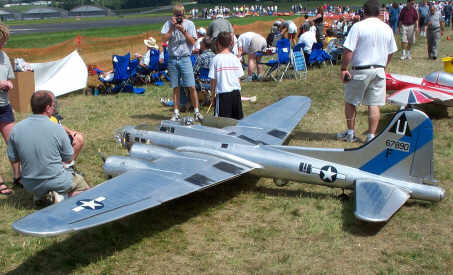 This huge B-17 was on display in the pit area. If it flew I wasn't there when it did. 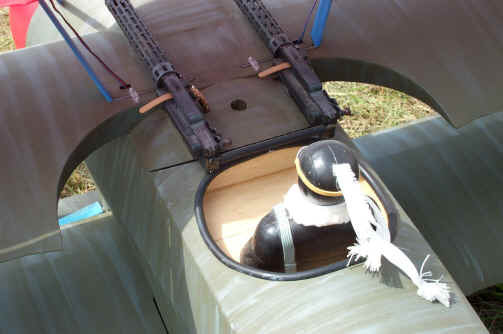 The plane was covered in aluminum skin with rivet details and full cockpit detail. 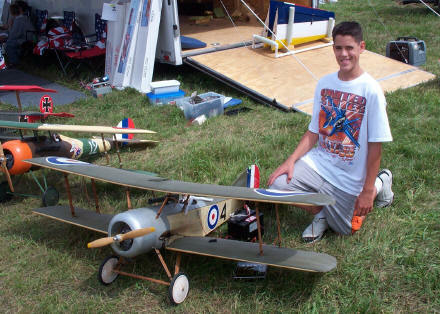 Danny Winship posing behind one of the Balsa USA display models. Balsa USA along with other manufacturers were on hand to sell and answer questions concerning their products. 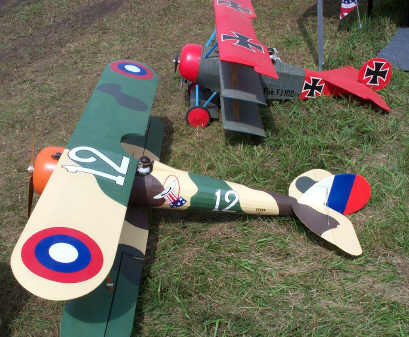 A few more Balsa USA airplanes. 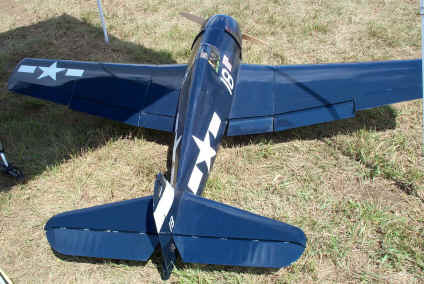 The one in the foreground is a new Neuport 28.C-1 out in kit form for $249.00 Wing span of 80" length of 61"
Balsa USA biplane close up. This Cap 232 appears to be close to 50%. There were row after row, planes on top of planes at the fly in. Too many to picture all of them here. Great looking Hellcat seen in the pit area.